Like still photography, a film camera creates the illusion of depth on the flat surface of a film strip. But for this illusion to be experienced, a film projector intermittently lights and magnifies successive frames on the film strip twenty-four times a second and bounces the resulting light patterns off a screen, creating the further illusion of motion from the strip of still images. In this sense, any film work is completed by the act of projection. But tonight's program features three works in which the film strip is not only displayed but modified by projection, as part of the work. These dual projection films – each requiring two simultaneously running 16mm projectors – exploit doubling of the screen to address the many dualities inherent to cinema. On January 27, 1966, a program of dual-projection works was presented at the Film-Makers’ Cinematheque in New York, advertised in the Village Voice as "double screen experiments by double screen experimentalists." The ad hoc nature of this category notwithstanding, the screening actually presented two key works of the newly emerging "expanded cinema." Andy Warhol's Outer and Inner Space premiered that night in two 33-minute reels that were originally shot sequentially, but projected simultaneously in adjacent frames on the screen. Barbara Rubin's Christmas on Earth, also shown, featured a unique exhibition method: instead of projecting side-by-side, one reel is projected inside the other in superimposition. That event appears to have been Warhol's very first foray into public double-screen projection; later that fall, he premiered what is probably the best-known of all double-screen films, The Chelsea Girls. Tonight's screening features less-known works from this era and after, which show how other prominent double-screen experimentalists used dual projection as a conceptual and aesthetic system of rich possibilities. In an era when both cinemas and galleries are standardized for single-screen digital projection, works such as these are more rarely screened than ever – yet they continue to hold fascination and possibilities beyond their historical moment. Despite increasing recognition of women filmmakers in the context of 1960s underground cinema, the prominent films of Storm de Hirsch have yet to receive sustained attention. A poet as well as filmmaker, de Hirsch made films that attempt to expand the boundaries of both cinema and consciousness, exemplifying the psychedelically inspired side of the New York underground. Her descriptive note for Third Eye Butterfly reads in part, "How can dust cover the arrows of light? How can darkness favor oblivion in the face of light? The variations of soul-touch exist in the auras of illumination. The Great Eye dominates." Both title and description reflect the main motifs seen in the film: light, imagery of drawn or printed butterflies, flowers, a distinctive "third eye" title logo that appears throughout the film – and not least, the kineticism of movement itself ("the arrows of light"). In conjunction with the driving jazz percussion score, the film is a dazzling experience. de Hirsch apparently filmed on unslit 16mm film intended for 8mm projection. In this process, half the film strip is photographed with a 16mm camera, then is flipped to photograph the other side of the strip, then is cut lengthwise into 8mm projection film by the lab. When left unslit and projected as 16mm, the image is doubled both top to bottom and left to right, producing a grid of four images (and eight images in double projection). de Hirsch exploits this multiplicity, producing a variety of kinetic movements across the grid pattern of imagery. de Hirsch constructs another layer of doubling by superimposing one image over another in many of the individual shots. Light is depicted as reflected off mirrored surfaces such as mylar – a doubling of the process of projection, which reflects the light of a film off the movie screen. Thus, Third Eye Butterfly itself mirrors the process of film projection and viewing – embodying the self-reflective wisdom suggested in its title. Takahiko Iimura's A Dance Party in the Kingdom of Lilliput is a short film separated into a number of fragmentary sections depicting activities, some of them performed naked, by the Japanese artist Sho Kazakura. The sections are arranged seemingly at random, each titled with the letter "K" (for Kazakura and also Kafka's "Mr. K"), accompanied by another random letter. (These single-lettered titles reinforce Iimura’s view of the entire film as a species of concrete poetry.) Dance Party first existed only as a single-screen film. In the dual projection edition, this original version comprises the left half of the screen. At some point, Iimura received a "bad print" of the film, apparently from the lab, and proceeded to further damage not only the imagery (by hand-scratching the emulsion on the print), but also the structure (by re-ordering the sections). This second, damaged version is screened adjacent to the original (which Iimura originally also intended to newly re-edit for each screening). In this way, the double-screen version of Dance Party reflects relations between present (the original version on the left suggests present time as a kind of "official" experience) and future (the inevitable damage inflicted on projected prints, and the concurrent re-splicing of experience) – a humorous acknowledgement of the sometimes nerve-wracking process of film projection, as a metaphor for ongoing time. Through its playful rearrangement of the alphabet and its disjunct construction, the left-side original of Dance Party subverts our sense of an ordered existence; and through the projection of the damaged version on the right, it incorporates its own physical breakdown into the work, and wittily transfers our anxieties about disorder to the screen. Paul Sharits' Shutter Interface (1975) was constructed as a four-projector gallery installation work meant to be looped over the run of an exhibition; it is seen here as a two-projector "economic" adaptation created by Sharits and limited to twenty-four minutes. Both reels consist entirely of groups of color frames (red, purple, pink, orange, yellow, blue) lasting from two to eight frames; each group is separated by a single black frame. On each reel a high-pitched tone accompanies each black frame. (The film subverts the idea of synchronized sound and image by having sound only when the screen is blank.) The two reels' soundtracks are stereo separated so that the left-right divide of the imagery is reproduced in the room sound. The speed of the film frames is such that at regular volume, the beeping sounds become a continuous, soothing counterpart to the imagery, just recognizable as individual tones and in their linear totality. Sharits gives two options for projecting Shutter Interface. For the entirety of version A, the two screens overlap precisely, resulting in three flashing color fields of equivalent size; the middle field necessarily contains and combines whatever colors are being projected on the left and right reels. Version B (which we will perform tonight) asks the projectionist to gradually merge the images together over the course of the screening, following a graphic diagram showing the two projectors’ positions over the duration of the film. In this version, the film begins with the two frames completely separate and ends with the two frames exactly superimposed. As version B of the film progresses, it transitions from two independent color fields to one color field made up of two interdependent parts. The individual frames can no longer be seen, only their combination into a whole. Sharits claimed to have keyed the frame rates of Shutter Interface to his own biological rhythms. This, together with the projection technique of gradually merging frames, gives Version B resonant political and emotional overtones – the relation of the individual to the collective, the aesthetic to the political, and the personal to the universal. Through its deliberate lack of development, Shutter Interface is intended as a contemplative, meditative work; yet it also continuously engages the viewer with a spectacular, subtle, seemingly endless array of color and movement. 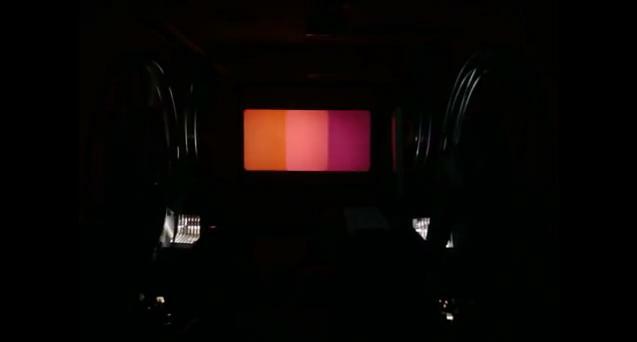 At times the overlapping screens and colors suggest a graphic, revolutionary "flag" for the kind of cinema Sharits intends, albeit a flag whose rectangular borders are constantly shifting; at other times, such as when the screens overlap completely, a gentler pulsation of color suggests distant lightning. Any number of other interpretations are possible, but the real subject of this film seems to be its own illusory motion. As Sharits announces in his title, Shutter Interface is about the intermittent shutter mechanism of the projector – the rotating blade which causes a given film frame to blink on and off the screen and thus provide us with the central illusion that drives motion pictures. But what is motion in a film that contains no movement? There is no photographed image of movement across the screen, or into and out of depth. Rather, the color frames flash on and off, in combinations nearly too fast to fully comprehend: the motion of consciousness, via consciousness of motion – or, at least, its illusion. As nearly always in Film Love shows, the projectors are in the room with the audience. As you watch Shutter Interface, we encourage you to move among them, to view the strip of images with its still color frames as it passes through the projector, to be conscious of cinema's illusion even as we are enthralled by it. Film's double illusions, motion and depth, are here illuminated by their absence (even as the projectors multiply). As viewers, we supply the illusion – and in this sense, Shutter Interface makes projectionists of us all. Thanks to MM Serra and Josh Guilford at Film-Makers’ Cooperative, and to Atlanta Contemporary Art Center. 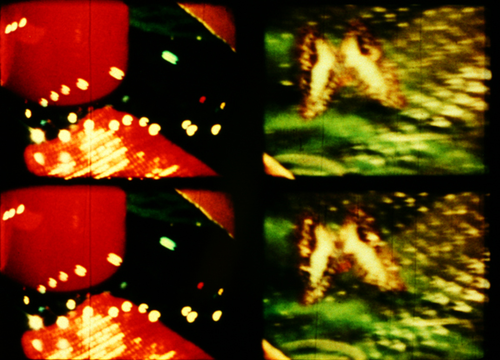 2 x 16mm is a Film Love event, programmed and hosted by Andy Ditzler for Frequent Small Meals. Film Love promotes awareness of the rich history of experimental and avant-garde film. Through public screenings and events, Film Love preserves the communal viewing experience, provides space for the discussion of film as art, and explores alternative forms of moving image projection and viewing. Film Love was voted Best Film Series in Atlanta by the critics of Creative Loafing in 2006, and was featured in Atlanta Magazine's Best of Atlanta 2009.